Evil Dictator. Smooth 12 foot jumper. I was walking down the street today when I saw a man that looked just like Saddam Hussein. “I thought he was dead,” I thought to myself. “Nope, still kicking,” Saddam said. “Yeah,” he whispered, “But let’s just keep that between us. 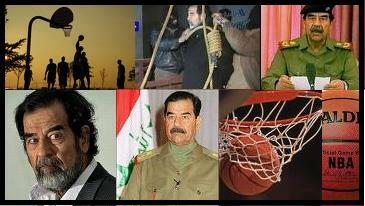 There are some folks who are still pretty unhappy with me.” Saddam motioned for us to walk and talk. He spoke openly about his ordeal. I guess it had been weighing on him pretty heavy. The execution had been a fake, the guy on the cell phone video was an imposter. “Why do you think they leaked a cell phone video?” he asked. Pretty easy to fake one of those. For a while he had to stay cooped up in this tiny apartment in Red Hook. These days it seemed like most people had forgotten all about him so he’s started trying to get out a little during the week. He said he was on the way to play some basketball with some friends and asked if I wanted to play. How could I say no? Let me tell you something about Saddam Hussein. He has a great mid-range jump shot. Smooth as silk. Trash-talker too. It became a little easier to remember that he had recently been employed as a brutal dictator after seeing him on the court. I wanted to bring it up. I kept trying to work up the nerve to ask him about it. The murder and the genocide. He seemed so agreeable now. Like a hip basketball playing grandfather. I could never bring myself to do it. I’m supposed to call him Thursday for some two-on-two. This entry was posted on March 16, 2010 at 7:01 am and is filed under Chance Meetings With Unsavory Characters. You can follow any responses to this entry through the RSS 2.0 feed. You can leave a response, or trackback from your own site.